The University Library houses significant and rare publications on American Indians. The first European account of North American Indians appeared in Thomas Hariot’s A Briefe and True Report of the New Found Land of Virginia (1590). Its drawings were by John White, a member of Sir Walter Raleigh’s sixteenth-century expeditions to coastal North Carolina. Critics acclaim this set of watercolors for their skill, detail, and fresh color. It has been published online by the Library’sDocumenting the American South project. 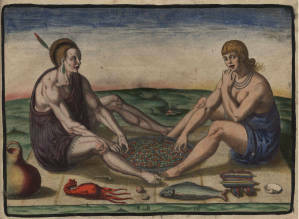 The Library has also digitized its copy of a rare, hand-colored version of White’s drawings published in 1590 by Theodor De Bry, a Belgian engraver. Working directly from White's watercolors, De Bry produced his own interpretation of the images, sometimes transforming the Indians into Europeans. Read Hariot’s A briefe and true report of the new found land of Virginia (1590) with White’s drawings.